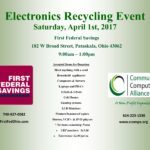 (Pataskala, Ohio) On Saturday April 1st 2017 from 9 a.m. – 1 p.m., Community Computer Alliance and First Federal Savings are teaming to co-present an electronics recycling drive at First Federal’s branch office located at 182 W Broad Street, Pataskala, Ohio 43062. Anyone wishing to donate computer equipment and other electronics can drop items off at the First Federal Savings parking lot during this event. Volunteers will be on hand to unload the donated items. All electronic data and personal information from computers is professionally erased by a secured three pass scrub of the hard drives. Acceptable items for donation include: Most all electronic devices, computers, Laptops, iPads, iPods and PDAs, cell phones, gaming systems, home stereos, VCR’s & DVD players, wires and cables, LCD and CRT monitors, keyboards, mice, printers, scanners, copiers, ink and toner cartridges and computer parts and accessories. **Please note items containing Freon will not be accepted and a small fee will be charged for televisions ($2.00 per inch) and CRT monitors ($15.00 ea.). Community Computer Alliance is a non-profit organization that offers workforce development to individuals with Autism and other developmental disabilities. Participants learn valuable job skills through dismantling, sorting, and rebuilding electronics, and training in workplace environment. First Federal Savings is a community-oriented financial institution that provides customized mortgage loans and deposit services for personal and small business needs, keeping technology at the forefront. Known for superior employee satisfaction, First Federal has received a Columbus CEO Top Workplaces Award three years in a row. The bank operates five branch offices within Licking County and a loan production office in Gahanna.